We’re not crabby, but our card sure is. Today we used the die Horseshoe Crab in two ways. First, to create this card add a little bit of Tim Holtz Ranger Distress Ink to the Crab, and the Crab comes to life. 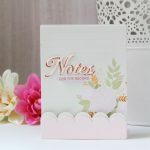 Use the Need a Rope embossing folder to create a background. Cut a few banners, stamp a sentiment, and you’re all done. Last, but not least, is the crabby party favor. 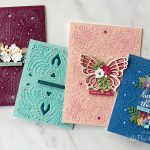 Create your Crab in the same manner as instructed then add some crackle glaze, heat with an embossing gun, and snap, crackle, pop… your crab comes to life! Brings new meaning to “crustacean”…lol! Thank you for stopping by. 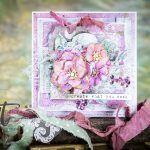 We would love for you to share projects that you have made using our Horseshoe Crab die, or any tips and tricks that you might like to share.